← Sunday Basics Class now at 4:00 p.m. Indeed, the light is slowly returning to lengthen our days. That is such a comforting thought to have as January moves us deeper into winter: “The sun a spark, / hung thin between / the dark and dark” (from John Updike’s poem, “January”). Hibernation is the natural response to the flurry of merry-making and overindulgence you may have experienced in the last couple of months. In child’s pose or a seated forward fold, embody the sensation of being a seed planted deep in the cold, dark earth, silently gathering resources that it will need to eventually strive for the light. Just stay there as long as it takes to feel the impulse to move. Be in your whole body with your breath and resist the nagging judgments of the mind. Allow sensation in the body to guide you, random thoughts to surface, intuition and inspiration to come. Have the courage to follow those intuitive hits, especially if they are guiding you to reach out to someone. Off the mat, give yourself that push to bundle up and go outside for a brisk walk. Trails at Lost River Cave or in other park settings provide natural beauty for you to experience the subtle colors of winter. Cultivate gratitude and acceptance of all that is true in the moment, inside and outside of you. We look forward to sharing the warmth of this community in the classes offered this January, and we are pleased to announce four special events, one change in class time, and one new teacher. New Year’s Day class and potluck brunch: To kick off 2015 with yoga, join Kim at 10 a.m. on New Year’s Day for a mixed-level holiday class. Mixed-level classes are accessible to everyone, with the teacher offering modifications and variations of poses to accommodate all students. After class, we invite everyone to stay for a casual, potluck brunch. We will provide a variety of hot teas and juices. Feel free to bring anything you care to share–or just to stay and enjoy the company, even if you don’t have an opportunity to bring anything. Restorative class: If you find yourself in need of some extra relaxation in the new year, mark your calendars for Friday, Jan. 16, when Susan Polk will offer a full class of Restorative yoga at 5:30 p.m.
Talk/meditation session: For the monthly discussion and meditation session, join Juanita on Friday, Jan. 23, immediately following the Yin class. There is no charge for this session, and everyone is welcome to learn more about meditation and its benefits and to experience a short meditation. 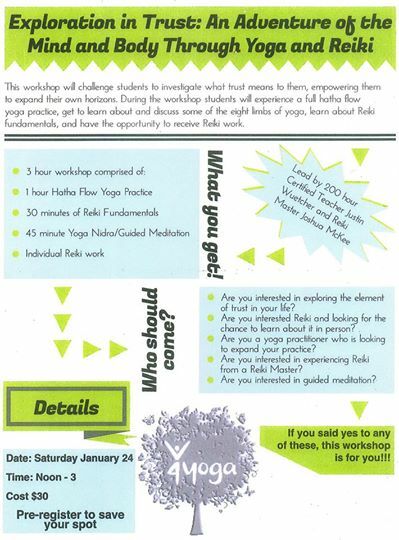 Exploration in Trust workshop: On Saturday, Jan. 24, two visiting teachers will offer a 3-hour workshop that combines yoga, meditation, and reiki. This workshop runs from noon–3 p.m. and is limited to the first 15 students to register. The cost is $30, and more information is available on the flyer. Sign up at the studio or send us an email to reserve your spot. Change in class time: The Sunday Basics class will now begin at 4 p.m. (instead of its previous 4:30 p.m.) for the remaining winter months. New teacher: We are also delighted to introduce (or, for many of you, re-introduce) Frances Strickler. Frances will teach the 9:30 a.m. Gentle classes on Tuesdays in January; she has been practicing yoga since 1999 and became a certified yoga instructor in May 2014. Frances has been teaching mixed-level classes at the Franklin Presbyterian Church and Franklin Community Education and has also taught gentle wellness classes at Harmony Therapeutic Yoga. Currently a Licensed Professional Clinical Counselor (LPCC), Frances is retired from SKYCC as a counselor and psychology instructor. Since her certification in May, Frances has attended continuing classes in Jackson and Memphis, Tennessee. For a full list of January classes, please see the the calendar section of this site or a hard copy available at The Pots Place. Inclement weather policy: If we need to cancel class because of winter weather, we will announce that cancellation at least one hour before the beginning of the class, and we will share the cancellation notice both via email and on Facebook. If you would like us to add a supplemental email address for you so that you receive these notices quickly (e.g., if you want both your work and home addresses in our list), please let us know. Happy 2015 from all of us at 4yoga! This entry was posted in guest teachers, schedule, workshop and tagged class schedule, Frances Strickler, January, restorative. Bookmark the permalink.